2018 Utlimate Upcycling Contest Winners Announced! We asked you to use your imagination to create the winning project and be named Goodwill's Ultimate Upcycler ... The votes are in and we're pleased to announce the 2018 winners are Crystal L. and Ryan D.! We also have two honorable mention entries, Kelly S. and Brett M.! Congratulations to our winners and THANK YOU to all who entered! The finalists have been narrowed down in Goodwill's Ultimate Upcycling Contest! We received more than 130 unique and creative submissions. See all the finalists now! Submissions Now Open for Goodwill's Ultimate Upcycling Contest! Goodwill is calling all artists, crafters and innovators! Here's you chance to show your mad skills and be named Goodwill's "Ultimate Upcycler." Use your imagination to create the winning project, but make sure that 75% of your materials are purchased from Goodwill. Goodwill's 2016 Ultimate Upcycling Contest is Coming Soon! 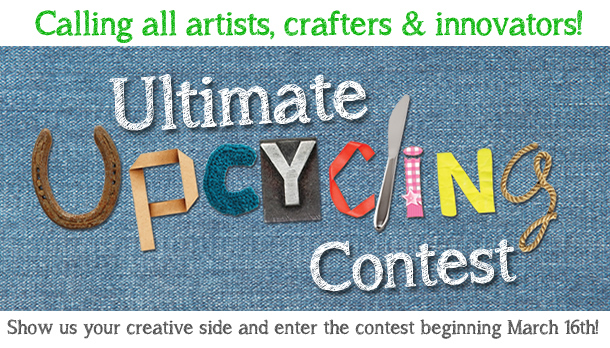 The Ultimate Upcycling Contest is Coming Soon! In honor of Earth Month, Goodwill is calling all artists, crafters and innovators! Here’s your chance to show your mad skills and be named Goodwill’s “Ultimate Upcycler.” Use your imagination to create the winning project, but make sure that 75% of your materials are purchased from Goodwill.